Do you Need Two Sets of Dishes? When Chris and I got married 14 years ago, we registered for an everyday set of dishes and a good set of Denby dishes. 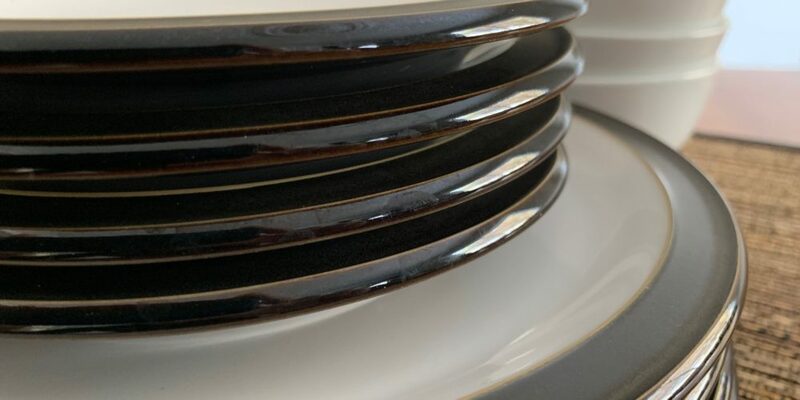 Unfortunately, we have rarely used our good set of dishes over the years and this is sad because I really I love them and think they’re beautiful. So we recently decided to donate our old everyday dishes and started using our good Denby dishes all the time. Watch the short video below to hear about it. This decision has created a lot more space in our kitchen by clearing up one whole cabinet. It has also made me appreciate the things I use on a daily basis a lot more. Using our Denby dishes everyday now brings me so much joy every time I use them. Yes, I know I’m talking about dishes here, but it really goes to show that using certain items, instead of storing them away, can change your perspective on things. If you’re like us and currently have two sets of dishes. I want you to re-evaluate whether you use both sets and whether you actually need to have two sets of dishes. Everyone’s situation is different so your answer may be different from mine. I am happy that we decided to pare down to just one set of dishes and have no regrets. What are your thoughts on this topic? Do you currently have two sets of dishes and if so, would you be willing to pare down to just one? Share your comments below! Jillian, I love this challenge because it challenges us to think about why we save the best for later? I started using my “good” dishes regularly and not at special events and I remember how great that felt! Then my Aunt gifted me her dishes…like five sets! Who needs five sets of dishes? Thanks for reminding us to not save things for later and how freeing it can be to let go of duplicates.